So I, like most of you, really really like pyramid charts to explain how something works. There’s a foundation, a middle structure, and a top. Without the strong foundation, everything crumbles. I’m going to once again credit Gray Cook for his creation of the “Optimum Performance Pyramid” from Athletic Body in Balance to explain what I think a good distance running program should look like. The OPP (Optimum Performance Pyramid) is essentially a pyramid that explains how to build an athlete. As you can see, The foundation is functional movement. Training the athlete to move well should be the most important aspect of the program. I’ll say it again: training the athlete to move well should be the most important aspect of the program. When movement is sacrificed, the exercise goes from good to bad. It becomes a rotten onion. I would consider soft tissue work and corrective core exercises to be in this foundation. Primarily, the athlete needs to learn to stabilize his lumbar spine while moving his hips in full range of motion. Exercises like these should be part of the athlete’s daily routine because to put it simply – he needs to be able to move the way I believe humans were built to move. When movement breaks down, the athlete will create energy leaks as well as putting himself at risk for injury. 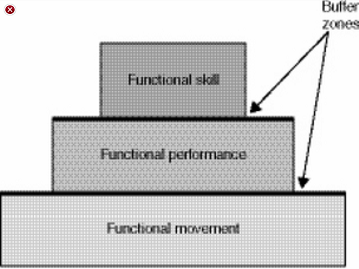 Good functional movement also creates very good body proprioception. Remember that we first learned to walk as infants through feel. This is a fact we should never forget. The second tier is functional performance. This tier deals with the general power output of the athlete, or basically how efficient each movement is. Cook refers to it as “gross athleticism”. According to Cook, the vertical leap is a very good indicator of general power output, and I would also consider a 50 meter sprint to be another good indicator. What I like about short sprints is that for distance runners, they can be considered to be under both levels – movement and performance. The athlete can work to perfect his sprinting motor pattern while also learning to produce more power. The second tier also deals with general strength training – pushing, pulling, squatting, bending, and sprinting. So we take the good movement of the first level and now add resistance to improve power and efficiency of movement. In a runner’s program, the second tier is strength training and short, sprint intervals to develop power. I choose sprinting because for obvious reasons, it’s the most sport specific. The third tier of the OPP is functional skill. As a distance runner, what would be the skill? This is not a trick question – as a distance runner, the skill is…that’s right…you guessed it…DISTANCE RUNNING! This level of the OPP consists of longer, pace work intervals and possibly (depending on the athlete) tempo runs. The athlete’s ability in functional movement and performance will dictate how long and how much pace work is in his program. For 5k training, this means anywhere from 400s to mile repeats at goal race pace. So an athlete who needs more work in the bottom tiers will be running shorter 5k intervals with less frequency while the more veteran athlete can be running longer intervals and possibly even 4-5 mile tempo runs. He will be able to handle the workload and develop his skill as a distance runner because he has spent years of developing his movement and power output and will ultimately be able to come close to maintaining the sprinting motor pattern that I have been talking about. It’s not about training more or less. It’s about training smarter. I think feel believe that this style of programming and this type of approach to running will yield better long term results and fewer running related injuries. If you are a distance runner and are jogging a large amount of mileage and use mileage as your indicator of a good training week, ask yourself – are you skipping steps? Are you running into injuries? Inconsistency in training? Fatique? Good training should make you feel GOOD. “Any type of training in excess is a loss of perspective” – Gray Cook. I bet Kenyan children can out sprint American children. Think about that.